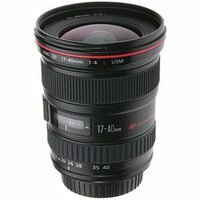 The Canon 17-40mm f/4 USM is an affordable L-series ultra-wide-angle zoom lens that's ideal for both film and digital SLRs. This EF lens focuses as close as 0.28m. It has a constant f/4 maximum aperture, and offers the choice of screw-in 77mm filters or a holder in the rear of the lens for up to 3 gel filters. The 17-40mm f4L also features a wear-resistant construction.